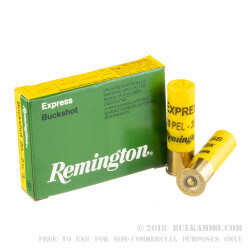 The Remington Express Buckshot was developed as a great hunting round at an affordable price. This load for 20 gauge shotguns is 2 3/4" long and is loaded with 20 #3 Buck pellets in a Remington Power-Piston one-piece wad. The load's velocity is measured at 1220 feet per second at 3 feet from the barrel. Customers find this product to shoot very good patterns for a 20 gauge load. The effective range for #3 Buckshot is a little over 30 yards with the proper choke. This ammunition is extremely versatile. 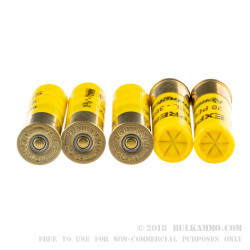 It is an effective deer hunting load, can be used for hunting larger birds at fairly close range, and would be a reliable home defense load that is less -likely than the larger Buckshot loads to over-penetrate barriers. Remington ammunition is made in Lonoke, Arkansas about 30 miles to the east of Little Rock. They built the plant there in 1970 and eventually moved all ammunition production to the Central Arkansas location. The company traces its beginnings back to 1816 when E. Remington and Sons was founded in 1816. The company is the United States's largest producer of rifles and shotguns to this day. 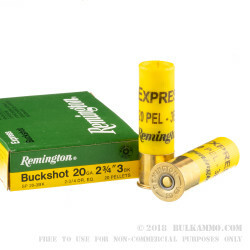 Q: Are shot sizes larger than #3 buckshot available for the 20 gauge? A: Yes, 00 buck is a common load for 20 gauge ammo. Q: How many pellets are in each shell? What is the muzzle velocity like? A: There are 20 pellets in each shell, and their muzzle velocity is 1200fps. Q: I'm new to guns so when storing your shot gun ammo or any ammo does the temperature and humidity affect how long the ammo will last? A: Yes, this has a huge effect on longevity. Store your ammo in a dry place that has cool temperatures and is away from sources of moisture and heat.